Some people find it odd I don’t believe in God but I can believe in Superman. I don’t mean believe the way you believe in aliens. I mean believe the way Gotham believed in Harvey Dent. God doesn’t seem calculated or judicious. God seems petty, jealous, wicked, and even demonic at times. People often speak of God as being “ineffable,” or beyond our comprehension. When an earthquake levels a small in South America or we can’t find a parking space at the movie theater for a film we’re already missing the previews for, we say God works in mysterious ways. We assume the choices and musing of God are far above our understanding. But humanity has a natural need to make sense even when sense seems vacant. We force square pegs into round holes or round pegs into holes that didn’t exist in the first place. This is where Superman comes in. He’s super strong, super fast, has an array of powers, and the most important element of all, he can always be trusted to make the right choice. I find this to be especially true when it comes to Superman. The character, on our planet, is practically unstoppable. He can do anything he wishes as a being. If Superman decided one day to destroy the world, there would be nothing to stop him. Superman, when first discovering his powers, had this choice, to become absolutely evil or absolutely good. He chose to do “the right thing” and save lives instead of taking them. Superman, unlike any god (biblical or otherwise,) is effable. I can see the thought process of Superman. He looks at situations with non-human eyes and makes choices based on who is being taken advantage of and who is taking advantage. This makes me think of God as someone who is trying to dup the world. Super villains are mysterious, calculated, and most of all have little to no regard for human life. This is what the biblical god seems like to me, a being of unimaginable power who has little regard for human life, taking it at his fancy. 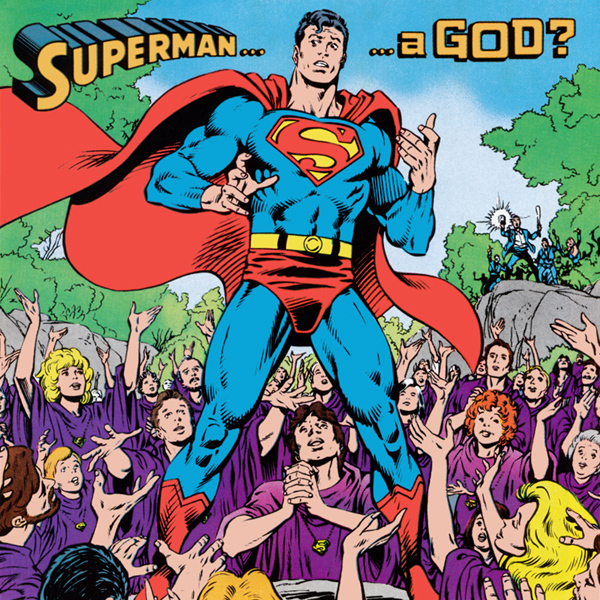 Superman seems to be this more human substitute for God, a more understandable and rational being with few to none of the petty human character flaws the biblical god seems to possess. He seems petty, jealous, and egotistical. If you cross God once, He brings the hammer of Thor down on you with no warning. Superman forgives. Superman has mercy. Superman won’t kill you but try to save you. Superman is, in the end, God. The character may not have started out with the intent of being used for a savior but he has evolved into one over time. Comic books have this odd reverse in identity. When most mediums begin they start out noble with artistic intent and integrity then slowly cascade into selling out and becoming more mainstream palatable. Comic books have done the opposite. They started off as this childlike medium, growing up with its readers instead of trying to collect new ones. Comic books now, over the past 30 years, have started to garner more and more respect and integrity. Have you read any Captain America from its early years? It’s almost strictly communist hunting. The book is practically a more palatable form of propaganda. Now Captain America is a character with dimension and more personality than simply the perfect American soldier. This is no different than Superman. He started off as a character for children but has evolved into a symbol for not simply American but the world at large. One great example of Superman mythology is Red Son, an alternate universe story where Superman lands in communist Russia instead of capitalist America. In this universe Superman still rises to his level of God, making the right choices for the world he was born into. Superman has become not simply an American symbol but an inadvertently religious symbol for many. He grew into a world where people put their faith in a God who can’t be seen and whose choices can’t always be rationalized. I feel many have taken solace in Superman and other heroes as a substitute for the world many of us cannot predict. We still have a desire to make the chaos into something understandable but we end up trying to put together a puzzle that wasn’t there in the first place.